With younger consumers eager to explore new flavors and better-for-you options, whole-grain pasta is winning greater acceptance in American diets. At the University of Iowa, whole-grain foods have won general acceptance, says Barry Greenberg, executive chef for university dining. Two marketplace dining facilities on campus offer whole-grain pasta as a regular option and incorporate it into baked pasta casseroles for variety. Such sauces as roasted vegetable marinara—where roasting brings out the inherent sweetness of mushrooms, zucchini, onion and garlic—and alfredo sauce enhanced with mushrooms and garlic, introduce pasta lovers to new flavor profiles. Plus, one dining hall also features a whole-grains bar that includes cold, cooked farro or barley, vegetables and beans for assembling custom bowl meals. 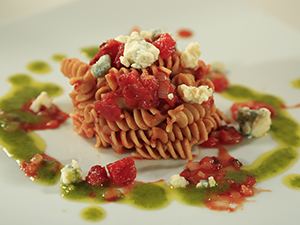 According to Barilla, whole-grain pasta has grown its share of the pasta category in foodservice to about the same level as retail—about 10 to 15 percent depending on the region. “With whole grain pasta, I don’t know if we are there yet, but I think we will get there eventually,” says Greenberg. But even so, whole-grain pasta has passed the inception phase and has become a familiar menu offering on some college campuses. Lisa Eberhart, RD, LDN, CDE, director of nutrition and wellness at North Carolina State University in Raleigh, N.C., sees the influence healthier K-12 school menus have on the eating habits of students arriving on campus today. She reports that they overwhelmingly accept brown rice, grilled cheese sandwiches on whole-wheat bread and burgers on whole-wheat buns. Additionally, they prefer water, not carbonated soft drinks, with meals. Similarly, at the University of Washington in Seattle, whole grains have made huge strides among students, says Campus Executive Chef Tracey MacRae. “People are more focused on getting whole grains into their diets,” says MacRae. In fact, a chef can be “less stealth health” and “more in-your-face health” with whole grains now. Made-to-order pasta bars at Washington offer students a serving of whole-grain penne or rotini plus their choice of fresh, seasonal produce and sauces. Other add-ons include feta and cotija cheese, grilled chicken and other proteins. “You walk away with a kind of a meat-and-three plate, or really a pasta-and-three plate,” says MacRae. As with many ingredients, trial is key to success. “If we can lead young adults to try things that are more ethnically diverse or healthier, nine times out of ten they love it,” says MacRae.